Thank you for visiting our fundraiser link. We are a bunch of young change makers who have devoted 2 prime years of their careers towards the betterment of Government Schools. We are called Gandhi Fellows and are currently working with 25 TMC schools in Thane. The kids attending these schools are from backgrounds where everyday is a struggle. Hence, the only exposure and escape they have are their schools. In order to make these schools fun learning spaces, we are trying to introduce a concept called BALA (Building As Learning Aid). 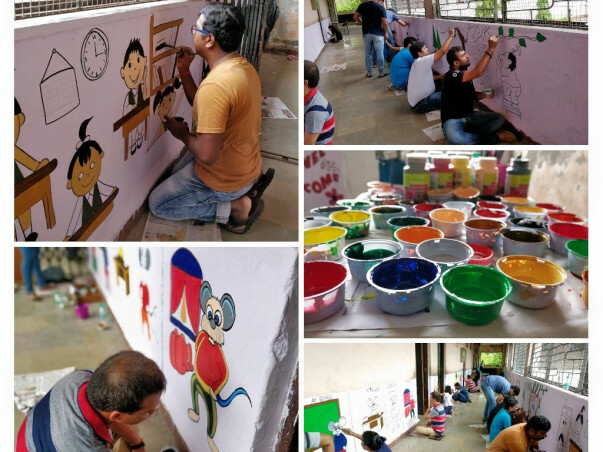 BALA aims to deliver educational content in a creative manner through vibrant and colorful pictures on the walls of the classrooms and school corridors. For this campaign, we needs wall colors and brushes. Hence, we want to reach out to as many people as possible who are willing to help us with this initiative. 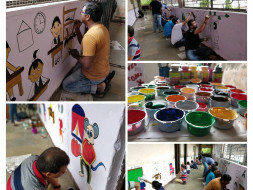 Let us try to paint the lives of these underprivileged children with vibrant colors of education. For Any Queries, please reach out to us. We have finished the paint project in 3 schools and we aim to finish it in 3 more schools by March. We will keep you posted as we progress. Thanks for all the support. We have successfully completed BALA in 2 schools. We will be doing it in 2 more schools in this month and the next. Thank you for your love. We are painting 2 schools with 3 floors on Saturday. Hence, we require more paints and brushes. Please keep supporting us. We shall keep you posted.